Lips are one of the most important features with respect to beauty of the face, especially in case of women. It is essential for the women to take care of their lips in the same way as they take care of their entire body. Dry and cracked lips are not at all acceptable. Women should provide appropriate moisture to the lips, so as to retain their luster, softness, and smoothness. The lips may become dry, chapped, and cracked due to exposure to cold winds. The following remedies would be of colossal help in getting rid of dry and cracked lips. 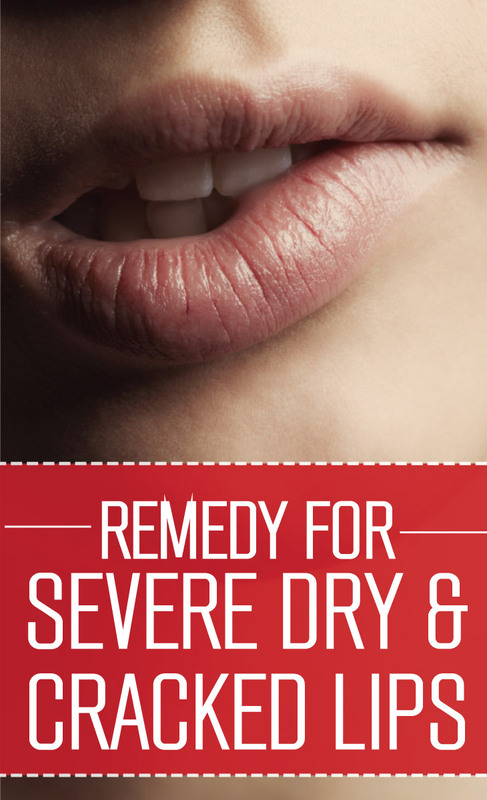 Dehydration is one of the major factors responsible for dry and cracked lips. With the help of maintaining appropriate level of hydration of the lips, the problem of dryness can be treated to a great extent. It is suggested to drink lot of water every day, so that the lips attain adequate moisture and hydration to remain soft, smooth, and hydrated. Around ten to twelve glasses of water are recommended every day to keep not only the lips, but the entire body, in good health and condition. Eating foods enriched with vitamin A would help in the growth and development of skin cells. The health of the lips would be improved considerably with the help of ingestion of foods enriched with vitamin A. Foods like winter squash, spinach, sweet potatoes, carrots, and tomatoes are rich in vitamin A, and ought to be included in the diet to make the lips soft and smooth. It is also a good alternative to include vitamin A supplements in the regular diet to deal with cracked lips. Cucumbers help in getting rid of dryness from the lips in a successful way. It is suggested to place cucumber slices on the lips and allow them to stay for a few minutes on the lips before taking them off. This home remedy would help in moisturizing the lips in a great way. Sunscreen is a vital skin care product for the lips. It is advised to apply lip balms enriched with sunscreen to prevent the lips from getting dehydrated due to exposure to harmful radiation of the sun. Also, lips balms with aloe vera are considered to be quite moisturizing for the lips. The moisturizing properties and antioxidants present in aloe vera would help in dealing with cracked lips in a successful way. Apart from the above discussed home remedies to get rid of cracked and dry lips, it is important to follow a healthy lifestyle. Tobacco smoking should be left altogether as a part of healthy lifestyle. Blood circulation in the entire body, including the lips, gets restricted due to tobacco smoking, consequently making the lips dry, rough, and chapped.